"...the yeoman's labor of a single editor, Ewald M. Plass, contained within this volume speaks for itself. The German language abilities of the editor, with regards to his copious reading of Luther, selections of texts, organization of texts, and original translations speaks to the skill and erudition that went into the production of this tome!" Ewald M. Plass (ed.). What Luther Says. Concordia Publishing House, 2006. 1667pp. $49.99. I am very glad to see the re-release of this book. The original publication was a shelf-filling three volumes, each of which was the same thickness of this newly published one volume edition. One volume, for me, is always better than three! The inside-matter seems to have the same type set and layout as the three volume set, the paper thickness is simply thinner; much like Bible paper. This volume, as I will also note below, came before many of the English translations of Luther's written works, notably the ground-breaking American Edition (vols. 1-55; ed. Jaroslov Pelican and Helmut T. Lehmann). At the time of the original publication of this book, no other volume existed that provided such a helpful tool to the arm-chair to schooled Luther-scholar. Therefore, its impact was immediately felt. Also, the yeoman's labor of a single editor, Ewald M. Plass (et. al. - that is, an advising committee), contained within this volume speaks for itself. The German language abilities of the editor, with regards to his copious reading of Luther, selections of texts, organization of texts, and original translations also speaks to the skill and erudition that went into the production of this tome. Though the content is helpful, and the work contained here in this volume is astounding, I have some hesitance about the volume. First, the new edition of this book could have been updated (actually updated, not simply re-released) and made more conversant with the American Works of Luther, now entering their second dispensation (vols. 56-75, ed. C. B. Brown - prospectus for this series). 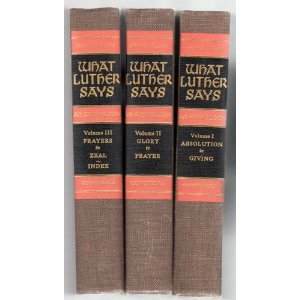 The original edition of this book was published in 1959 - before Luther's American Works were all published and released. So not having an English collection of Luther's written works to cross reference for the original release of this book is excusable. The re-release of this volume, though, would have furnished the present-day reader with a better tool by adding cross references especially to the American Works (LW), and maybe even to the other earlier, less extensive Works of Martin Luther (The Philadelphia Edition), if Concordia PH felt like being completely thorough. Many laborers, I imagine, would have been more than ready and willing to build upon the already astounding database of Plass' original edition of this work. As it stands, this volume has no reference to an English translation to Luther's written works; a sure deficiency to this new edition, and a hindrance to a broad audience seeking to know the context of Luther's sayings. 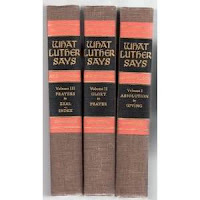 The written works of Luther's this volume cross references only German, the Weimar, Erlangen, and the revised Halle or Walch editions; of course, like its previous edition. Second, this volume, like any compilation volume of this type (those characterizing an author or theologian via sayings on topics), runs the risk reflecting the views and convictions of the editor(s), rather than the character of the author/theologian, her/himself. I think in some places that this could be true for this volume. It seems this volume projects upon Luther the sentiments/convictions of the editor, rather than the man himself, i.e., Luther (this work came from a Wisconsin based wing of the LCMS if that helps at all). For example, look up "drink". We do not find in this entry any of the spicy and cavalier sayings of Luther on drink and drunkenness. It sounds like one side of Luther, the tame, agreeable-to-'fundy'/conservatives-Luther, not the one who spoke clearly of Christian freedom. And who was at times too a sinner (or, per Luther, was "Simul iustus et peccator" - "At the same time righteous and a sinner"). 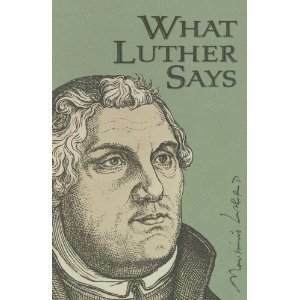 See Eric W. Gritsch, The Wit of Martin Luther (also, 2006), (a little pamphlet-sized book) for many sayings that may in some cases characterize Luther better than those you may not find in this presently reviewed tome. Luther was anything but tame, therefore those sayings should also be included. But of course, this criticism is true of the previous edition as much as it is for this new release, since they both contain the same content. Overall, this work, like its previous edition, has to be commended for all the work that went into it. At the point of the original publication (1959) nothing like it existed! Many helpful studies will be drawn from this classic work. But, in the end, an actual update rather than simply a reformatting of the volume size, then publication, by Concordia may have been more helpful to the modern reader, who presently has access to English translations of Luther.